Just finished the walk through of the Renwick Gallery with Brightest Young Things where I’ll be Gonging on behalf of Take Five Meditation on Friday September 7th at 8:30. This just in!! I’ll also be stepping back into my DJ shoes for a special burning man inspired set. Get your tickets! In this workshop we will be exploring a Hatha/Vinyasa Yoga class where we will focus on key alignment points, some fundamental principles of yoga, physical and energetic benefits, and pranayama (breathing techniques). We will first spend some time warming the major joints of the body as well as the spine before moving into the more invigorating standing Hatha/Vinyasa flow portion of the practice. Unlike a typical vinyasa class, we will be moving slowly and mindfully in and out of postures with plenty of holding time and breathing in the postures. Once we reach the peak of the asana (posture) practice, we will be begin to slowly coast down into a deeper meditative Yin yoga practice where we will incorporate the Sacred 8 Yoga Wheels. Upon coming down to the floor, David will guide you through a beautiful sequence aimed at aligning, recalibrating and elongating your spine, while releasing your heart, hips and shoulders. This will facilitate in increased flexibility/mobility in your joints, deeper, relaxed breathing, better posture and overall health and wellness of the body and mind. A healthy spine = A healthy mind. Lastly we'll experience poses that provide a counter stretch and neutralize the spine, allowing for a balanced practice and deeper understanding of the joys of back bending before coming into a long relaxing Savasana. This workshop is appropriate for those with beginner to advanced yoga experience. 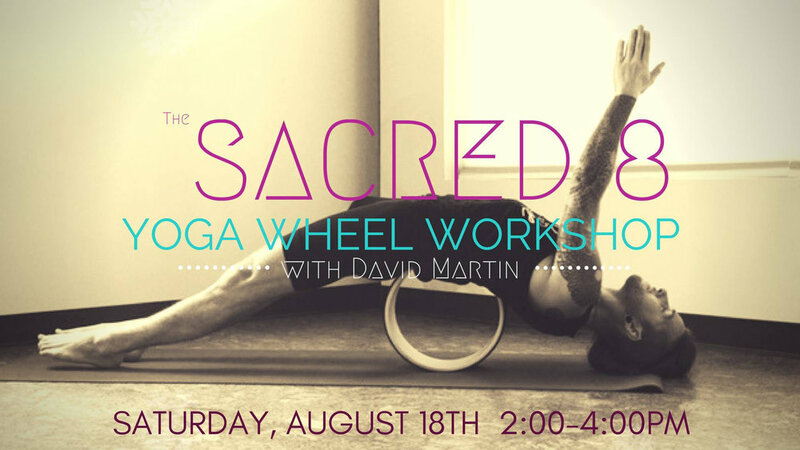 The Sacred 8 Yoga Wheels will be provided for participants during the workshop. They are hand crafted by David and are regularly priced at $80 but will be offered at a discounted rate of $65 for attendees if they are interested in purchasing one. Cost: $35 in advance, $40 day of. Visit here to purchase tickets.